Bigger vehicles with improved mileage means better sales. 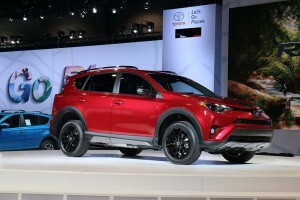 The fuel economy of the Toyota RAV4 has risen by 10 mpg in five years. Sales have jumped by 166% during that time. Improvements in fuel economy have helped manufacturers gain a competitive edge in selling pickups, crossovers and sport utility vehicles, according to the authors of The Car Book. A new analysis from the Consumer Federation of America indicates SUVs, pickups and crossovers that improved fuel economy ratings by at least 10% between 2011 to 2016, saw a 59% increase in sales. On the other hand, vehicles in the same segment that lagged behind in fuel economy with less than a 10% increase in miles per gallon from during the same period experienced a 41% increase in sales, almost 20 points less. Gillis noted the Toyota RAV4, which boosted its fuel economy by 10 mpg from 2011 to 2016 and saw a sales increase of almost 220,000 units, a 166% increase, in annual vehicle sales. Meanwhile, the GMC Terrain which had a 1 mpg decrease saw only a 6% increase in sales from 2011 to 2016. And even though consumers are increasingly choosing crossover models over sedans, the typical crossover now gets 10% better gas mileage than in 2011, thanks to fuel economy standards that are currently under threat of a rollback, Gillis said. GM is currently rolling out a new version of GMC Terrain, which is somewhat smaller than the vehicle it is replacing and is expected to get better fuel economy. Research done the University of Michigan’s Michael Sivak and Brandon Schoettle indicates that the fuel-economy has held steady during the recent surge in sales of trucks and SUVs as manufacturers bring out more fuel-efficient vehicles in these segments. Overall improvements in fuel economy have been harder to come by over the 18 months, according to the UMTRI survey. The average fuel economy or window-sticker value of new vehicles sold in the U.S. in May was 25.3 mpg — unchanged from April and the same as a year ago. The value for May is up 5.2 mpg since October 2007, the first month of our monitoring of UMTRI survey but down 0.2 mpg from the peak of 25.5 mpg reached in August 2014 just after oil prices and the price of gasoline began to decline. Oil prices have never recovered helping set the stage for the boom in truck and SUV sales. Gillis, however, complained that manufacturers want to roll back recent gains in fuel economy, which will hurt consumers. GM’s CEO Mary Barra appeared at a forum Monday sponsored by the U.S. Department of Commerce during which she praised the Trump administration for rolling back various regulations. Gillis also noted Congress is now working on a bill that will lower mileage requirements for these larger vehicles. “While the automakers may try to ‘lay the blame’ on their customers for ‘needing’ to roll back the standards, consumers are voting for the higher mileage vehicles with their dollars,” said Gillis. “This short-sighted thinking by Congress and the auto companies ignores consumer demand for more fuel efficiency. As gas prices creep back up, car companies will be in the same spot they were back in 2009 when they had to be bailed out by the government, with lots filled with larger, fuel inefficient vehicles they can’t sell,” he added. Gillis said “the bottom line” is that consumers want fuel economy, whether they’re driving a compact or pickup, and the current mpg standards are delivering it for them. This entry was posted on Tuesday, June 20th, 2017 at and is filed under Automobiles. You can follow any responses to this entry through the RSS 2.0 feed. Both comments and pings are currently closed.